On a recent trip to Rome we rented an apartment just outside of the historic centre and a stone’s throw away from the famed Bar Pompi, renowned for its tiramisù. The classic Italian dessert comes in a variety of sizes from dinky single-serving boxes to giant take-away slabs for dinner parties. Their excellent tiramisù also comes in all manner of flavours: there’s the classic coffee, nutella, chocolate and banana, pistachio, strawberry, forest fruits and this summer’s limited edition piña colada! I didn’t happen to see a cherry version but I’m certain it’s been done before. Inspired by the delicious Italian amarena ice cream and all the fresh cherries appearing in the shops I decided that it was time to make a tribute to Bar Pompi. Unfortunately fresh cherries are still far too expensive to buy in the quantity you’d need for this recipe so I limited myself to buying just five to go on top. Yes, I actually did that. For the filing I used a jar of Black Forest cherries preserved in a light syrup that my local branch of Lidl seem to stock all year round. For £1.69 they’re really rather good, not too sweet and not as flavourless as the tinned cherries you can get. 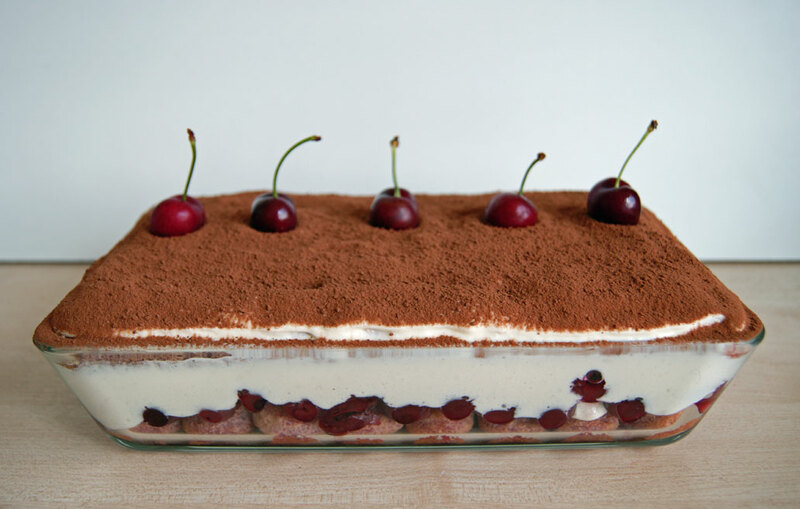 My tiramisù was enjoyed by all and made a really special desert for my grandfather’s birthday (especially since he’s a cherry-holic). It was lighter than the Pompi version but still creamy and velvety smooth; the cherries provide an excellent foil to all that richness. The biscuits, having only been very briefly dipped in bandy-infused cherry juice, were not only a lovely shade of pink but also still spongy rather than soggy. In fact, I was so pleased with how this dessert turned out that it’s made it into my little black book of recipes – I hope it feels honoured! In a large bowl beat the mascarpone until softened and smooth. Place the yolks in another bowl and add 50g of sugar and the vanilla. Whisk until light and fluffy. Pour the yolks into the mascarpone and mix until smooth. With a clean whisk, beat the egg whites until they form soft peaks. Add the remaining 50g of sugar and beat until they form firm peaks. Stir a third of the whites into the mascarpone to loosen the mixture. Gently fold in the remaining whites a little at a time. Drain the cherries and reserve the juice. Take half of the juice and mix with the brandy in a shallow dish. 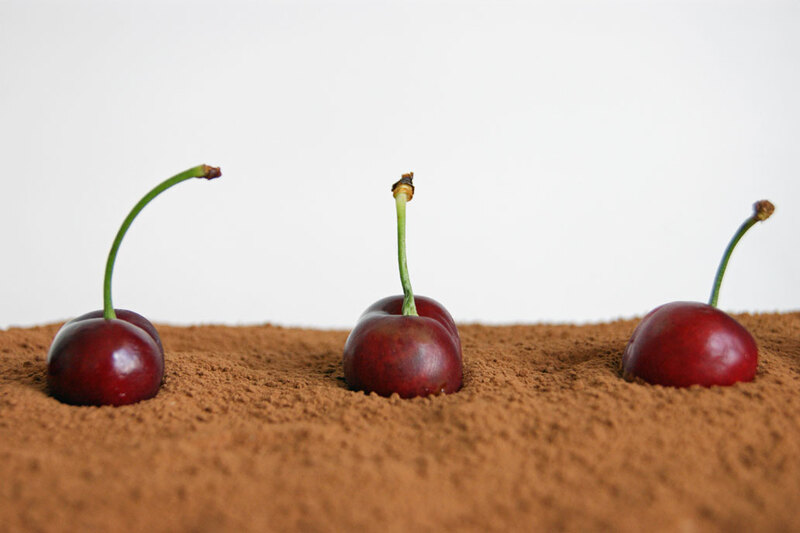 One at a time, dip the savoiardi quickly into the cherry juice – don’t soak them. Arrange them so they cover the base of your dish one layer deep. 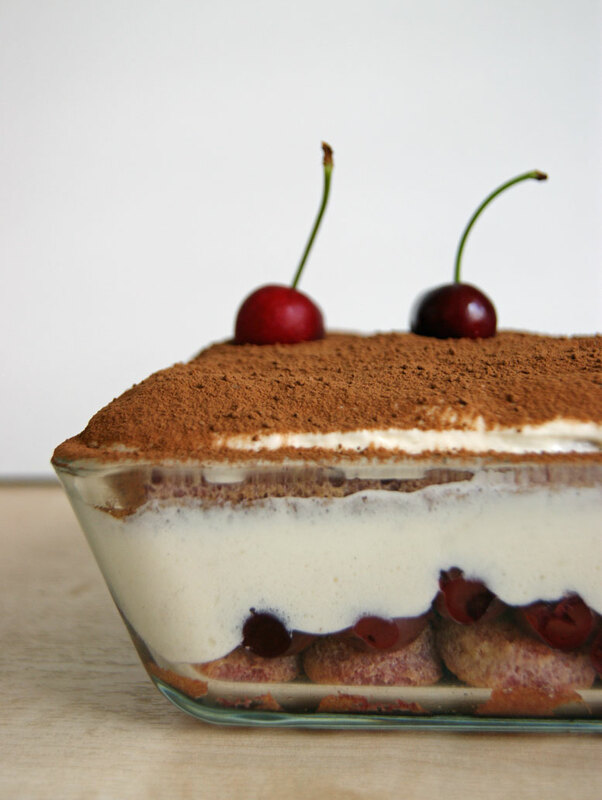 Scatter the cherries over the savoiardi layer then top with half the mascarpone cream. 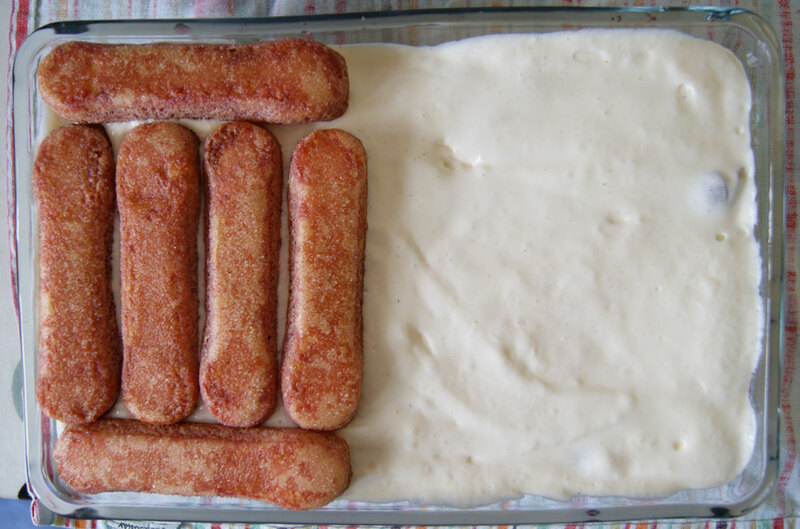 Top with another layer of dipped savoiardi and then the remaining mascarpone. Finish with a dusting of cocoa powder and fresh cherries. Chill for at least 3 hours before serving. *Admittedly this recipe creates a few annoying leftovers but, having tweaked the quantities, they should be things you can use in other recipes rather than say half a pack of savoiardi that will just be relegated to the biscuit tin. If you’re in the UK you’ll most likely only be able to buy mascarpone in 250g tubs, leaving you with 100g spare, but you can easily stir that into a pasta sauce. You will also have some cherry juice left over which is delicious mixed with champagne or with a shot of brandy and lemonade. Cheers!